Get Your Money Metals Insider July/August 2015 Issue Free Today! 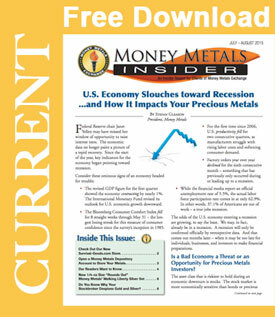 Access Your Free Copy of Money Metals Insider NOW! Well, today I'm giving you access to our new July/August 2015 edition – for free! Responding to requests of our customers, our company continues to launch some great new products and services. For example, if you wish to store your precious metals securely in a fully segregated account, open an account at Money Metals Depository by calling 1-800-800-1865! And we recently launched www.Survival-Goods.com – your one-stop shop for emergency food, supplies, and gear. Take a look! Do You Know Why Your Stockbroker Despises Gold and Silver?